It's not clear if the shared data will be used in Gmail, but Microsoft offers a similar feature called Windows Live People that's integrated with Hotmail. "Windows Live People allows real-time updates to contact's information. Suppose one of the user's contacts just moved and has a new home address. When that contact enters their new information in Windows Live People, the user's contact list across Windows Live services is automatically updated in real time." "What do you think?" is the comment prompt. I think that a GOOG-hater would say that Google is now copying Microsoft. Is this available in Google Apps? it's not possible to separate information, I mean that I cannot share, for example, home phone just with family and friends and job phone with colleagues, so for me it's not useful. My hope is that Google will bring this over to Google Apps and all our users can freely make whatever info they'd like with the other users in the domain. Yes, having a tiered system where one group had one level of information and another group had a different level would be nice, though as it is it's not a deal-breaker as you can choose the group who you most want to be privy to your info and make the appropriate level available to them. That is great that user can share these data. But how can I check the data shared with me? In the contact manager? I can't figure it out. I setup my contact information with my primary Gmail address.. and shared it with my secondary one. I'm not sure how I can see it with the secondary one. How do you go about viewing the contact details? You can see the details in the "Contact info" tab of the same Google Profile. 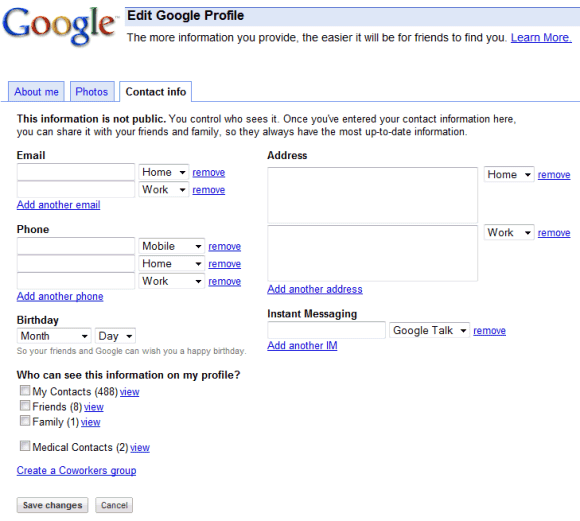 The URL of your Google Profile can be obtained by going to this page. It's slowly heading in the right direction. I wish it would update in other people's contacts and vice-versa. I would love it say, when a friend gets a new phone number, he updates his profile, which in turn updates in my gmail, which I sync to my phone, and then I have the new number, without having to do anything at all. Google has this feature, facebook has the feature, MS has the feature, yahoo will have it soon, and none of them will work together. Imagine if the Telephone or electricity world worked like this. "Aw nuts, I'm with ATT and that cute girl is on Sprint, so I can't call her" or "I would love that new gadget, but it won't charge in my houses electric socket. How about, "Ah, I would love to go to Disney land, but the roads are for GM cars, and I drive a Toyota." This is the problem with Web 2.0. You can search profiles of other in search box. But, it searches all public profiles. We should have option to search profiles that are in our contacts only.